Charlie Sheen Invites "Two and a Half Men's" Angus T. Jones to Join "Anger Management"
Jones' former costar insists the CBS comedy hit is "cursed" and wants his former TV nephew on his FX series. Charlie Sheen, pictured here at the MTV Movie Awards in Los Angeles, has extended an invitation to former co-star Angus T. Jones to join him on his new FX series "Anger Management." Charlie Sheen asking Angus T. Jones to join anger management is a bit like the pot calling the kettle black, no? But in this case, Sheen is asking his old "Two and a Half Men" costar to appear on his FX series "Anger Management," should Jones find himself out of work after the 19-year-old publically trashed his own show. 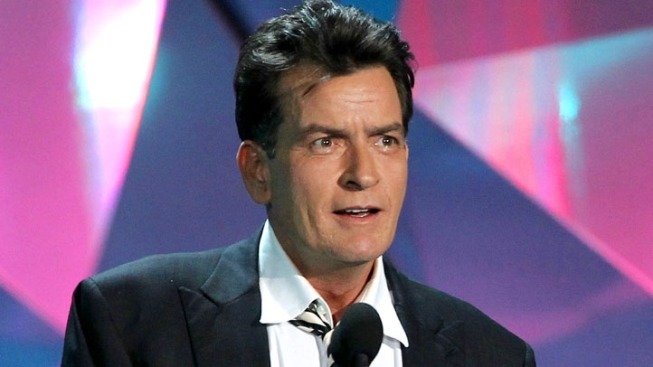 "My former nephew is welcome at the Goodson Anger Management home anytime," Sheen told ABCNews.com, referencing his therapist character, Charlie Goodson. Yesterday, Sheen, who had his own public feud with "Two and a Half Men," told E! News that Jones' video was a "Hale-Bopp-like meltdown," even going as far as to call the show "cursed." Funny how star Jon Cryer has managed to not spiral out of control or bash his own show and win two Emmys for his role on "Two and a Half Men" in the process. Doesn't sound too cursed to us. Jones has since apologized for his actions, referring to "misunderstanding" and saying he is "grateful" to be on Two and a Half Men.